Gold American Eagle coins are among the most diverse offerings in the precious metals industry today. The series includes three different version of the coin, bullion, proof, and burnished, as well as four total weights for investors and collectors to choose from annually. Today, Silver.com offers the 2002-W ½ oz Proof Gold American Eagle coin in perfect condition. There are 503 coins available from the PCGS with this grade! Gold American Eagle coins were introduced in 1986 following passage of the Gold Bullion Coin Act of 1985 by Congress. The legislation paved the way for the production of an official gold bullion coin of the United States, and stipulated that all coins in the series contain only gold sourced from within the US. The program includes a bullion coin for investors, a burnished coin for coin exhibitors, and these proof coins for collectors. Proof coin production has surged in the last three decades as numismatists flock to the sharper rims and enhance design features of proof strikings. 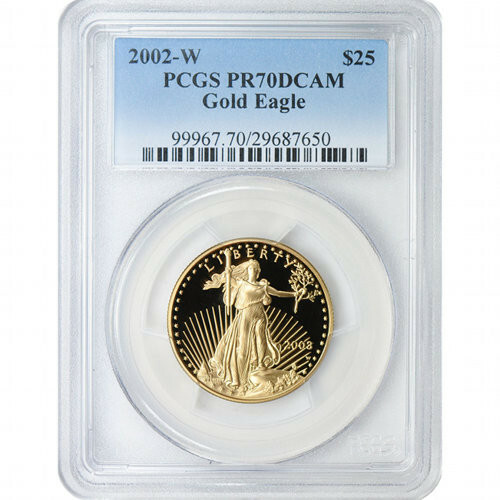 Each of these 2002-W ½ oz Proof Gold American Eagle coins is a perfect strike, PR70 coin. The PCGS defines a perfect coin as one with its full, original mint luster and no detracting flaws of any kind. In addition to its perfect status, these coins are the 15th annual striking of ½ oz Proof Gold American Eagles after the coins were introduced in 1987 for the first time. A deep-cameo coin is one with a strong, frosted finish on the design set and a deeply-mirrored, clear background field. The stark contrast creates the image of a design set that floats above its background field. Augustus Saint-Gaudens’ depiction of Lady Liberty, created in 1907, is featured on the obverse of all Gold American Eagle coins. Sculptor Miley Busiek’s image of a family of nesting bald eagles is used on the reverse, and is an exclusive design of the Gold American Eagle series. If you have any questions, please don’t hesitate to reach out to Silver.com. Our associates are available at 888-989-7223, online using our live chat, or via email. To view similar items, check out our selection of Graded Proof Gold American Eagles.